Sin87 or someone who mods a favor, PLEASE? I recently saw that sin 87 created a mod of the kelvin....which looks great by the way, I had an Idea for it, wet cant impliment it because I know nothing of modding besides piddling with the .odf files. the Idea I had started with this thread on Trek BBS: Facts About Captain Robau - The Trek BBS I think this would be a big hit so here goes. Alter the stats of the Kelvin to cost alot of money, be basically indestructable, and have a special weapon called "Robau's Rage". (Bassically a shockwave that wipes out everything or some high powered beam or torpedo that destroys ANYTHING in one shot. Also give the Kelvin the ability to "Cleanse" a planet in 2 seconds. Name this MOD the U.S.S. Kelvin "BADASS" edition. We at trekbbs would all love this, The only names for the ship should be the Kelvin, Robau, or BADASS. This would be greatly appreciated as I have tried but am not savvy enough to Impliment this mod myself, (nor can I ask sin87's permission) so, how about it, anyone?...esp. sin87? So essentially a god ship of sorts? and have a special weapon called "Robau's Rage". (Bassically a shockwave that wipes out everything or some high powered beam or torpedo that destroys ANYTHING in one shot. Also give the Kelvin the ability to "Cleanse" a planet in 2 seconds. I really dont get this? What do you even mean by "cleanse"? Name this MOD the U.S.S. Kelvin "BADASS" edition. We at trekbbs would all love this... The only names for the ship should be the Kelvin, Robau, or BADASS. A little overblown now dont you think? Makes it really cheezy in some way. This would be greatly appreciated as I have tried but am not savvy enough to Impliment this mod myself, (nor can I ask sin87's permission) so, how about it, anyone?...esp. sin87? I do agree with everything jetfreak said here. and I really get a bad taste in my mouth when I read "cleanse". besides, as we get a lot of "personalised" forum entries lately: why dont you just send that guy Sin 87 a PM? Yea Why can't you ask his permission? This mod is more the realization of a joke we have going on in this thread about how awesome Capt. Robau and the kelvin are (Yes I know they prob get blown up 5 min into the movie, thats not the point.) This MOD isnt meant to be taken seriously....as I said, its an optional comedy thing, that I (and several others at trek bbs would love to see and play) thanks. OK yesterday I finally got round to working on my Kelvin for the first time in over a month & right before I went to bed I spent half an hour seeing if I could reduce the model down to a good poly count. 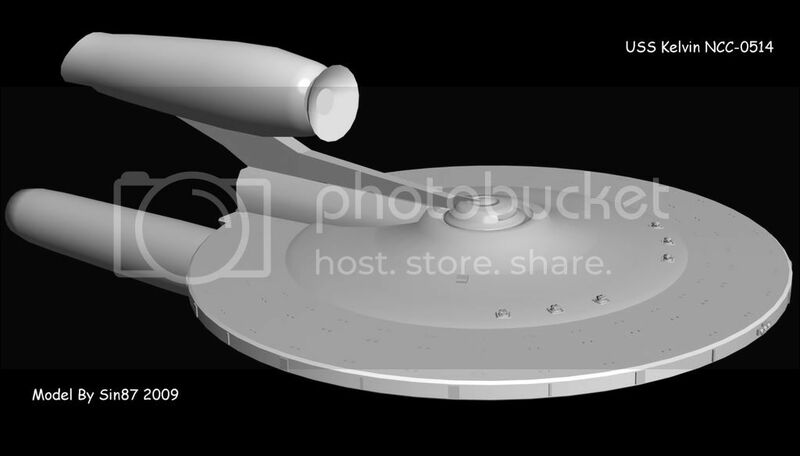 I manged to reduce it from 12,000 to just over 5,000 polys so I may do your idea in the near future or at least release a newer proper USS Kelvin that is more than just a kit-bash of a Proxima class. Note the picture is of a older model version & not the reduced poly model, Though the reduced version dose look very similar to this. The detail on her is amazing, you even got those turrets there. What's the poly count of that model?